This is one of my most favourite topics.... I LOVE creating sacred and magical containers conducive to consciousness, transformation, and creativity! I invite you to use the opportunity that is this course, with some gentle guidance from me, to carve out a space in your heart and home dedicated to your creative and spiritual unfolding. If your space already exists, perhaps this exercise will be an invitation to revisit, shift, love, or occupy it even more deeply. Creating your own sacred creative space is a way of claiming and integrating your ongoing creative and spiritual development into your daily life. Depending on what is available, you might choose to design a space for reading, meditating, writing, dancing, yoga, making music and/or visual art. This space will ultimately serve as a lovely reminder of what you consider important in your life. Ideally, this space would be somewhat permanent. For some of us, it can be time consuming or discouraging to repeatedly set up and tear down a space each time we want to create in it. (I used to paint in my dining room and would have to pack up and unpack constantly). That said, if permanence isn't a possibility or you prefer portability, consider getting really slick in your design of a portable space for efficient setup when the time comes. Sometimes temporary spaces can feel particularly alive and inspiring. It is important to get clear on the energies and possibilities you aim to evoke in your space. When I create a physical space, before objects are even chosen and organized, I start by becoming aware of my inner sacred space. From this inner space, I can set an intention, lean in and trust what flows intuitively from it. If I am creating a space designed to support the healing process of another, my work is to apply the same principles of awareness, wisdom, compassion, forgiveness and release in my own heart. It's true, you can create sacred space regardless of the actual square footage available to you. You don't need a huge studio, or even your own room, in order to create something inspiring and meaningful for yourself. Consider those areas of your home where you love to spend time, as well as those that are overlooked. Maybe you have an empty space or a little corner just waiting to be developed. Perhaps you are ready to turn an under-utilized room into a studio, or a small shelf into an altar. Lighting is important to me, so my early morning meditation space is in a place that feels dark and womb-like, while my painting and writing spaces are those where there is an abundance of natural light to inspire me. Throughout my life I've created sacred spaces ranging from my own closet to a large, gorgeous communal space we called The Creative Commons. I've also created the tiniest of sacred spaces with women experiencing intimate partner violence, whose sacred space needed to be safe and discreet. Sometimes, the intentional creation of an inner sacred space is all that is possible and, sometimes, it’s all we need. Throughout the design process, continue to hold your intention in your heart as a guide. 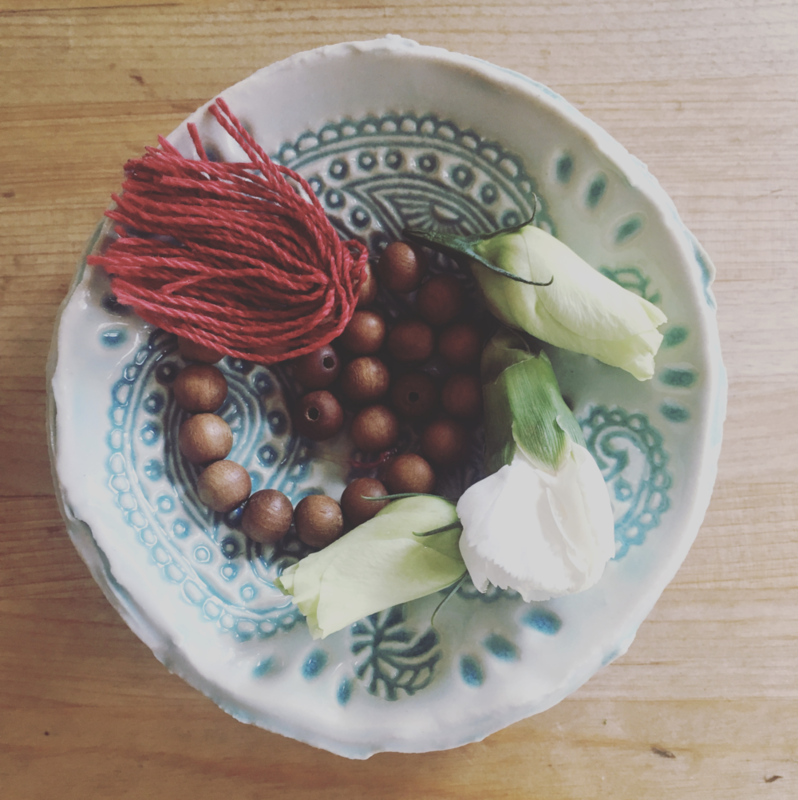 I might create a space or an altar that holds my intention for a retreat, or space for someone I'm working with, or for my own personal practice. Rather than plan what it will look like in advance, I allow the intention to illuminate an optimal design. 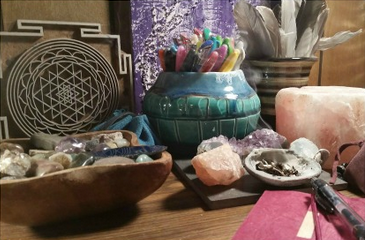 When building my altar, I will often walk around my home and gather objects that sparkle and call my attention. Or I might pull from my stashes of sacred crystals, feathers, and other special goodies collected over the years. Less is sometimes more, especially in our creative spaces. If a space is already filled by objects, it can feel cramped and we feel tense in response. Interestingly, an empty space can also feel uncomfortable and overwhelming. At times, the largeness of a space has actually called into question my ability to use it, my worthiness. Fortunately, this discomfort also made me aware of the ways I have kept myself small, comfortable and aligned with the status quo. Some of us have a tendency to get so excited about creating the space that we confuse this process with the intention of actively enabling more creativity in our lives. In order to consciously integrate that creativity, like any new practice, it can be helpful to make a clear plan about when and how we’ll do it. For instance, will you use your meditation spot at 6am daily? Will you light your special candle every time you start to make dinner? Will you do an hour of painting in your new creative corner each night after the kids are in bed? I find that the more a space is used with intention, the more it magnetizes or calls me to engage with my creative and spiritual practice. Eventually, your sacred creative space will hold an energy field of its own. It will joyfully draw you in and support your efforts whenever you occupy it.